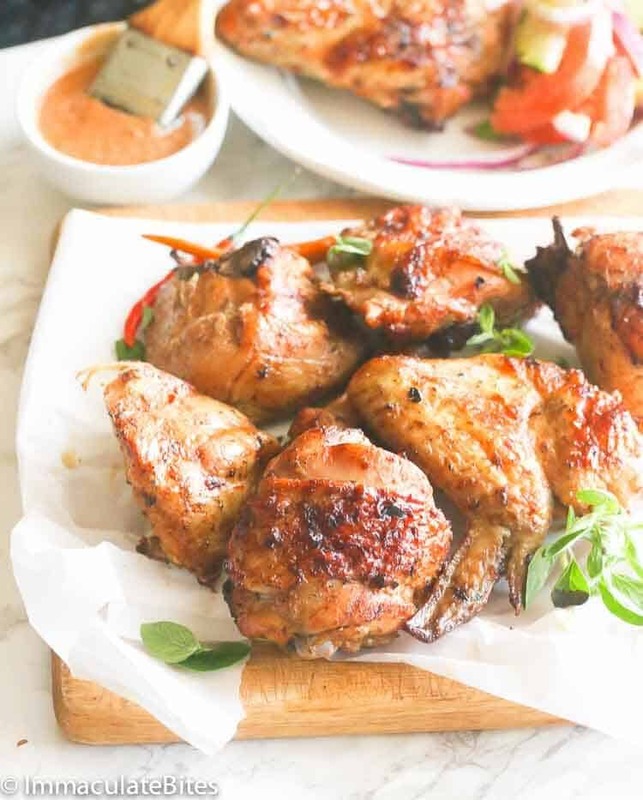 Mozambique Peri Peri Grill Chicken or roast chicken – moist, juicy, beautifully browned chicken with a smokey spicy coconut creamy sauce. So good, easy and tasty! You’re going to want to make it all the time! Is there any more perfect way to cook than with the grill? Not according to me. As soon as the grill is fired up, everyone starts moving outside on the patio. There is something about the environment, everyone in anticipation of…. the aroma wafting through the air, your mouth salivating, and it all makes you just want to dive in, even before the meat has reached it’s desired doneness. Ok, confession time. I can’t tell you how many times I have eaten steak that is barely cooked. I just can’t wait, not to talk of vegetables. I never do a sit down when it has to do with grill food. Unfortunately, when it comes to chicken you can’t afford to do that. And that arouses my appetite even more. This Mozambique Grill Peri Peri Chicken would do that to you. 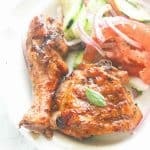 I had previously made peri peri chicken, but this one is totally different from the other one. It’s got one secret ingredient that makes all the difference – coconut milk. 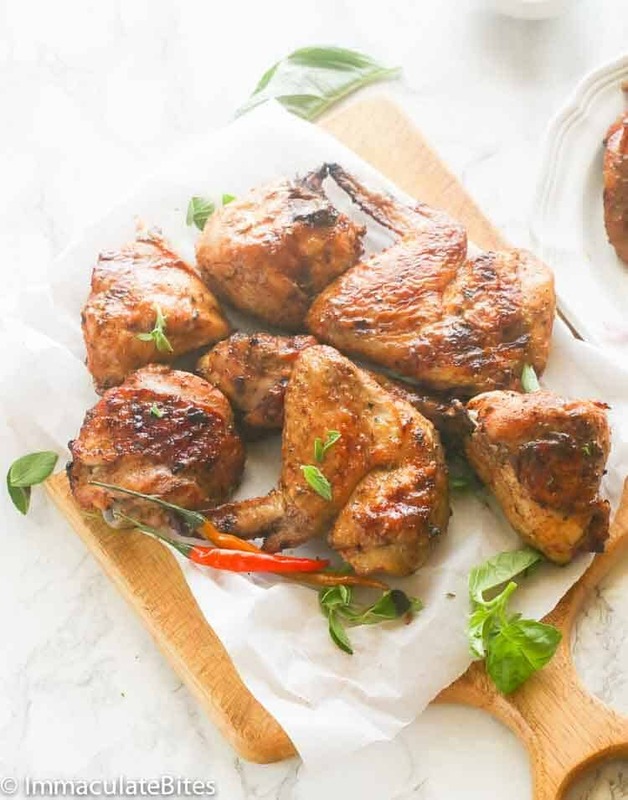 This would be something totally different from your everyday grill chicken- I promise. This is how to go about it –you need some fresh chili and it is totally up to you on how many you want to use. I only added one tiny chili pepper, I wanted the flavor not the heat (grilling for the kids too). Two (2) medium chili peppers works just perfect. Jalapeno peppers, fresh garlic, red pepper, basil, onions and oregano are also part of the spice blend. Blend everything together with some olive oil and coconut milk as needed. Then add some paprika, salt, lemon and it works out just fine. All these ingredients come together to form one complex and versatile sauce that you can use on almost anything. The good thing is you can adjust the pepper to suit your heat level. If you are a heat seeker then double the peppers!!! Here’s a quick and helpful video from Jamie Oliver on how to zest and juice a lemon easily. You can always use a butterflied or spatchcocked chicken for a more appealing visual presentation. Just grill it skin side up for 30 minutes and check temperature after every 10 minutes or so until the breast part reads 160-165 F (71-74 C) and the thighs is 165-170 F (74-77 C). Then 10 minutes before the end, flip it skin side down to achieve a crispy skin. If serving this dish for the kids, throw in 1 tiny chili pepper and 2 medium pepper if exclusively for adults. As always, adjust it base on your preference. The red pepper is a key ingredient in it. However, it also tastes great without it. This recipe was first published on June 2015 and has been updated with new photos and some tips and notes. Mozambique Peri Peri Grill Chicken or roast chicken - moist, juicy, beautifully browned chicken with a smokey spicy coconut creamy sauce. So good, easy and tasty! You're going to want to make it all the time! ½ teaspoon salt plus more to taste. 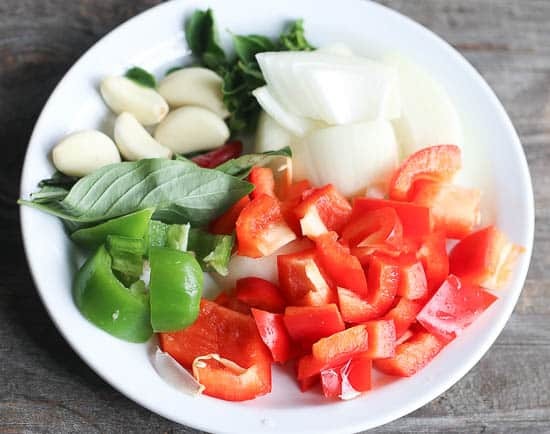 Blend red pepper, jalapeno pepper, chili pepper, garlic, basil, oregano, and onions in a food processor or blender. Add olive oil, coconut milk to facilitate blending. Then mix in smoked paprika, lemon juice, black or white pepper and coconut milk. Adjust for salt and seasoning. Refrigerate and use when ready. You may make this a day or more ahead of time. 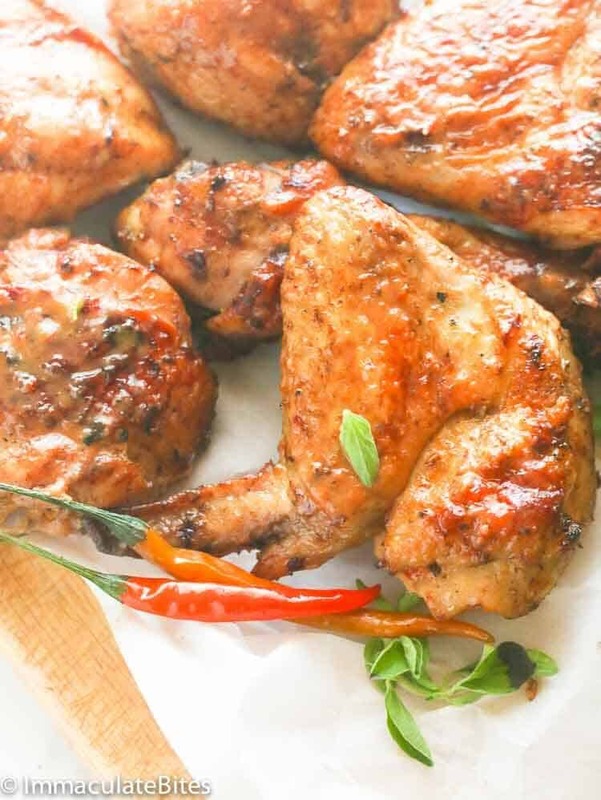 Drench the chicken with peri- peri marinate, place in a zip lock bag, or sealed containers and refrigerate for at least 2 hours, preferably overnight. When ready to grill. 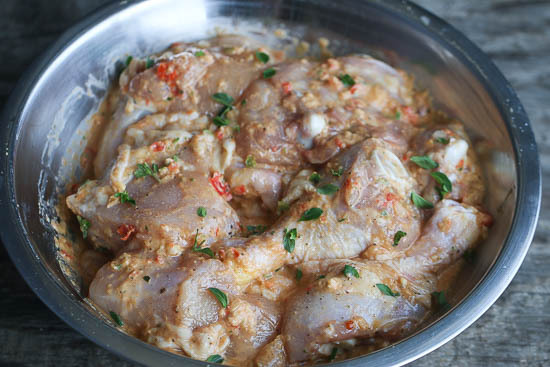 Using a tong, remove chicken from the peri peri marinade and remove excess marinate. Reserve the marinade. Place chicken on the grill and grill for about 10-15 minutes an each side you may need to turn the chicken occasionally on each side until it is cooked all the way. Do this in batches if you have a small grill. In a small saucepan, simmer the remaining peri peri marinade and the one from the chicken for about 7 minutes. Serve with chicken or mix with chicken. When ready to bake, preheat oven to 425° F.
Line a baking pan with foil; top with a wire rack. Arrange chicken pieces out in a single layer. Bake chicken until cooked through and skin is crispy, about 45-50 minutes-rotate half ways through-roughly 20 minutes. 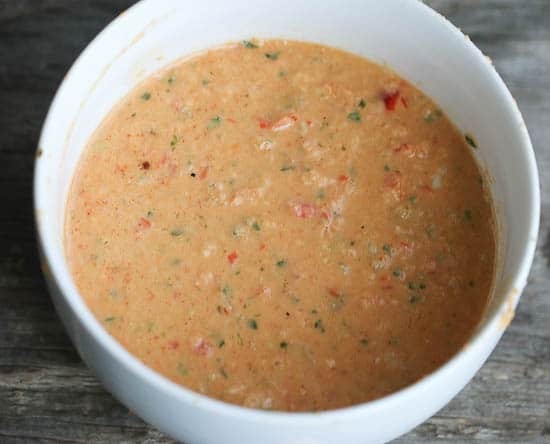 Blend red pepper, jalapeno pepper, chili pepper, garlic, basil, oregano, and onions in a food processor or blender. Add olive oil, coconut milk to facilitate blending. Then mix in smoked paprika, lemon juice, black or white pepper and coconut milk. Adjust for salt and seasoning. Refrigerate and use when ready. You may make this a day or more ahead of time. Trim chicken of excess fat and pat dry with a cloth or paper napkin. Rub with lemon, and season with salt, chicken bouillon and pepper. 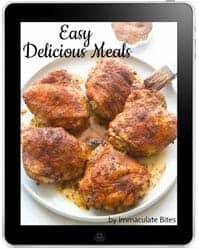 Drench the chicken with peri- peri marinate, place in a zip lock bag, or sealed containers and refrigerate for at least 2 hours, preferably overnight. When ready to grill. 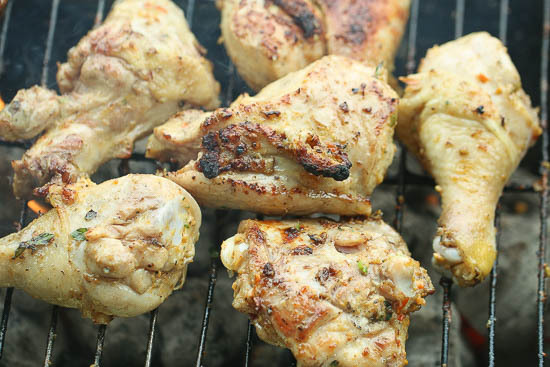 Using a tong, remove chicken from the peri peri marinade and remove excess marinate. Reserve the marinade. Preheat grill to medium- high heat. Place chicken on the grill and grill for about 10-15 minutes an each side you may need to turn the chicken occasionally on each side until it is cooked all the way. Do this in batches if you have a small grill. This recipe is now a braai staple for us. The flavours are sublime. If anything I tend to up the chillis a little……Guests always comment how great it is Well done! Just wanted to say that I AM SO GLAD YOU EXIST. I am making a cookbook for my parents after a year on the road of all of my favorite dishes so they can try to eat some of my favorite things from abroad. It seems like every time I google an African dish you’re one of the first results and people have GREAT things to say about everything from your Chipati, Chakalaka, to this! Aww, you are too sweet Jessie! That is such a neat idea! Your parents would be thrilled! I am going to borrow it for other projects . Thanks for taking the time to share this with me . Do let me know how the recipes are working you. I’m making this tomorrow thank you. Awesome! Do let me how it works out for you. If you had actual peri peri pepper (dried) how much would you suggest adding and what other adjustments to the recipe would recommend? I would add about 1 more pepper and adjust to taste. No other substitution is needed. 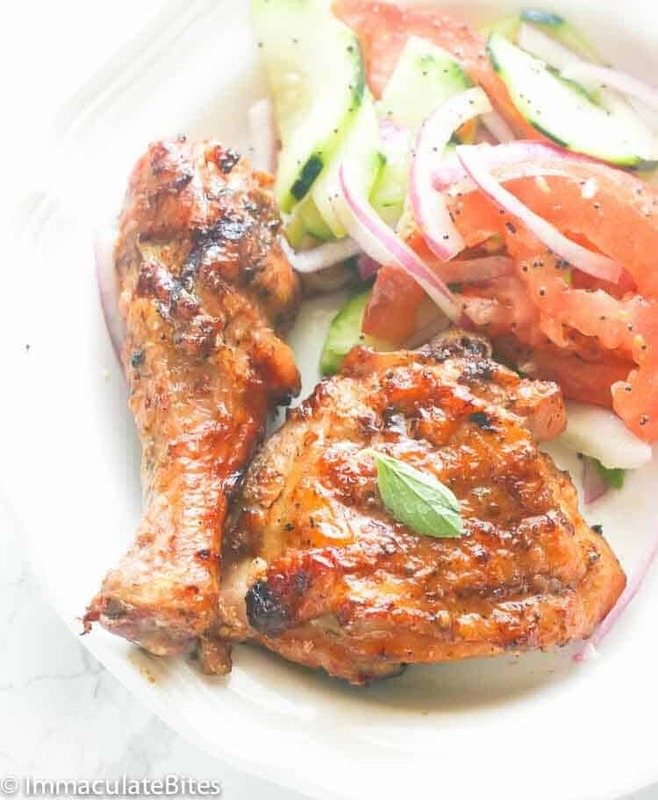 I just stumbled upon this mouth-watering recipe ’cause I’ve been looking for some authentic piripiri recipe. And with coconut milk in it I think the meat would be so moist and tasty. Just wanna ask if its possible to make this with turkey? Thanksgiving will be next week and I want to serve the ‘star’ of the day, something with a twist and new to our friends. That is a great idea! I don’t see why not. Definitely trying this out next year. This mouth watering dish is out of this world.We made it for some friends and now I cant get rid of them. I dont know of any other manner to improve on chicken, but this one is really a winner. 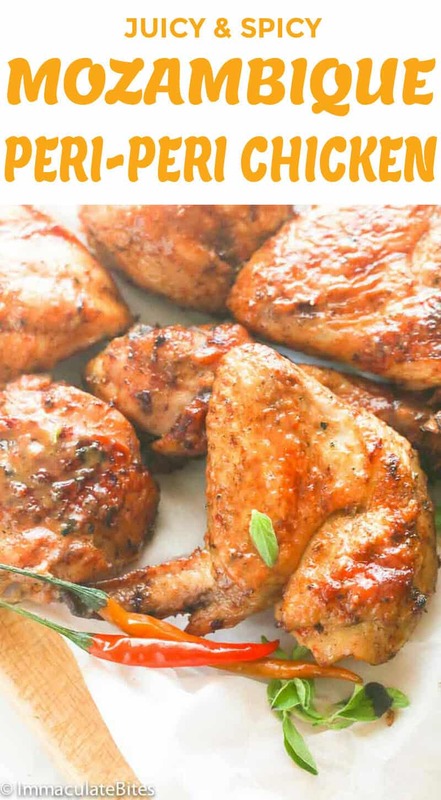 To any chicken lovers out there I suggest you try this recipe,you wont want to eat chicken any other way. Hahaha!!! I really love this Mozambique chicken too! Thanks for taking the time to share your thoughts with me Lou. OMG I just made the Peri Peri chicken on the grill. It was phenomenal!! I was looking for a recipe as I just returned from Tanzania. I was missing their food so much. Thank you for bringing Africa back to me!!!! My pleasure! Glad you enjoyed it ! Made this tonight but with an orange bell pepper instead of red. The color is a little off but it is so delicious! Love your blog. AWESOME!!!!! Angie, OWN IT! You are GREAT COOK. Not everyone can whip it up girrrl. So happy for you. Thank you for taking the time to share this with me. A BIG virtual hug. Which is better? Doing in the stove or grilling in a pan as if searing ? Is the red colour of the sauce on the side in the picture coming from the red pepper ? Did you use olive oil to fry that sauce? The red pepper is a key ingredient in it. However, it tastes great without it. I would leave it as is. Do include it next time. Yes, the redness is from the red bell pepper and smoked paprika. Grilling is always better to me. Can’t beat that smokey taste. This recipe was great.. I am still just learning how to cook and I stumbled upon this by accident..
Coconut milk does wonders for the chicken.. It sure does. Can’t do without it . So glad you enjoyed it. As always, you have completely delighted this particular chile-head. I’m going to try finding the peri peri pepper actually, wondering how it compares with scotch bonnet. I’ll be back. Hi Greg!I hope you are going to be even more delighted when you try this. This is my take on scotch bonnet, I love the flavor – but it is not as hot as peri peri . We’ve debated on this a few times and the jury is still out. Hubby’s favorite is peri peri- I think it’s just a matter of preference . Which ever you choose is going to be just fine. Hmmmm, gosh this is just wow! getting this done ASAP… got me dumbfounded. Hi Keke! Let me know how your like it. Thanks . These peri peri chicken bites look droolworthy! I still have some chicken wings in the freezer and this seems the perfectest recipe to use them up. Thanks for sharing the recipe, Immaculate. Hi Angie! This would go really well with those wings, please let me know how it works out! I know Charlene, it is all the rage in England and for good reason -It is tasty. Wow, will definitely try it out. I am sure my family will love it. Kay, let me know how it works out for you. Ohhhh – I love sauces like these that bring out the best in chicken. Bintu,the sauce takes it to another level. Hahaha Maureen! I am high Maintenance , I think its is better for you to just make it. I knew you would love this Nagi. Can’t wait to see what you cook up. Sounds like the best marinade in the world! Can just imagine how tenderized that chicken gets…how it crisps nicely on the embers, how lusciously juicy it is inside…Drool! That is all I have to say. Thank you for a show stopper! Jeanette, It sure has this explosion of flavors going on in your mouth. I couldn’t wait for it to come out of the grill.